June 10th marked the 105th anniversary of Iowa's worst mass murder, the 1912 Villisca axe murders. The award-winning and critically-acclaimed true crime documentary Villisca: Living with a Mystery, produced by Emmy-nominated filmmakers Kelly Rundle and Tammy Rundle of Fourth Wall Films, will air on WQPT-Quad Cities PBS Thursday, June 22 at 8:00 p.m. The documentary features interviews with Villisca case expert Dr. Edgar Epperly and the late Robert K. Ressler, a former FBI agent, forensic profiler and the author of “Whoever Fights Monsters”. Following Villisca, the short award-winning documentary AXMAN will air at 10 p.m. The Rundles' Fourth Wall Films is an independent film and video production company. They produced the regional Emmy® nominated documentaries Letters Home to Hero Street (with WQPT-PBS), River to River: Iowa's Forgotten Highway 6 and Country School: One Room – One Nation; and the award-winning films Movie Star: The Secret Lives of Jean Seberg (with co-producer Garry McGee), Lost Nation: The Ioway 1, 2 & 3 and The Barn Raisers. For more information, visit FourthWallFilms.com. Dr. Edgar Epperly, a retired professor of education at Luther College in Decorah, Iowa, began researching the Villisca crime in 1955. He interviewed hundreds of key figures connected to the case and has given numerous lectures and presentations on the subject. He has appeared on national television and radio, and was the primary historical consultant on Kelly and Tammy Rundle’s Villisca: Living with a Mystery. Epperly is co-writing a book on the Villisca case with the Rundles. It is slated for release in the fall of 2017. June 10th marks the 104th anniversary of Iowa's worst mass murder, the 1912 Villisca axe murders. The award-winning and critically-acclaimed true crime documentary Villisca: Living with a Mystery, produced by Emmy-nominated filmmakers Kelly Rundle and Tammy Rundle of Fourth Wall Films, will air on WQPT-Quad Cities PBS on Sunday, June 5th at 8:30 p.m. The documentary features interviews with Villisca case expert Dr. Edgar Epperly and the late Robert K. Ressler, a former FBI agent, forensic profiler and the author of “Whoever Fights Monsters”. Sometime during the night of Sunday, June 9, 1912, a person or persons unknown entered a modest house in Villisca, Iowa and bludgeoned to death Josiah B. Moore, his wife Sara, and their children Herman, Katherine, Boyd, and Paul and overnight guests Lena and Ina Stillinger. The crime, known thereafter as the “Villisca axe murders”, is the most notorious unsolved mystery in Iowa history. The tragedy spawned nearly ten years of grand jury investigations and three sensational, made and broke political careers and led to the establishment of the Iowa Department of Criminal Investigation. The murders also split residents of the small community of Villisca, Iowa over the guilt or innocence of a local suspect, Iowa State Senator Frank Fernando Jones. Monmouth, Illinois was the site of a similar murder in 1911. The Villisca crime may have been connected to the Monmouth crime and similar murders in several Midwestern locations. 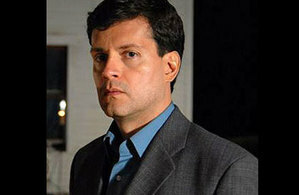 Dr. Edgar Epperly in Villisca: Living with a Mystery. Villisca: Living with a Mystery was the Rundles’ first documentary film and it qualified for the 2005 Academy Award competition in the Documentary Feature category. The film was partially funded by a grant from Humanities Iowa and the National Endowment for the Humanities. The Rundles' Fourth Wall Films is an independent film and video production company. They produced the regional Emmy® nominated documentaries Letters Home to Hero Street (with WQPT-PBS) and Country School: One Room – One Nation; and the award-winning films Movie Star: The Secret Lives of Jean Seberg (with co-producer Garry McGee), River to River: Iowa's Forgotten Highway 6, and Lost Nation: The Ioway 1, 2 & 3. For more information, visit FourthWallFilms.com. Producer Kelly Rundle talks with Montgomery County historian/writer Elaine Artlip of Villisca. Iowa Public Television (IPTV-PBS) will broadcast the award-winning documentary Country School: One Room - One Nation by Tammy and Kelly Rundle (Villisca: Living with a Mystery, Lost Nation: The Ioway, Movie Star: The Secret Lives of Jean Seberg) on Friday, August 24, 2012 at 9:00 p.m. The film recently received a regional Emmy-nomination in the Historical Documentary category and has won numerous film festival awards and recognition. Country schools took rough-hewn pioneers and multilingual immigrants and transformed them into a literate and patriotic new nation. Whether personally, or through a parent or grandparent, the country school as an American architectural icon, is as imprinted on our perception of the nation’s early history as the log cabin and the general store. Stories told by former teachers and students are often nostalgic, but they are also dramatic, humorous, and heart-wrenching. In addition to Country School, the Rundles produced the award-winning documentaries Villisca: Living with a Mystery, about the 1912 unsolved Villisca, Iowa axe murders of 8, and Lost Nation: The Ioway, a film about the Ioway Indians. Currently they are in production on the documentary River to River: Iowa's Forgotten Highway 6, and a docudrama entitled Sons & Daughters of Thunder, based on the play by Earlene Hawley and Curtis Heeter. 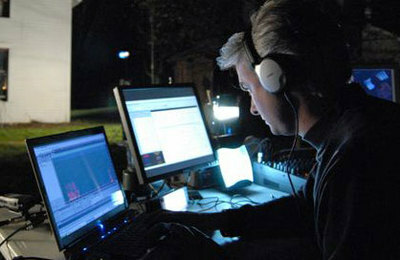 They are in post-production on Lost Nation: The Ioway 2&3, to be released in November; and Movie Star: The Secret Lives of Jean Seberg, a co-production with Emmy-nominated filmmaker Garry McGee, slated for release in May/June 2013. Country School was shot in Iowa, Kansas, Wisconsin, Nebraska, Missouri and Illinois and received grant awards from Humanities Iowa, Silos and Smokestacks National Heritage Area, the Kansas Humanities and the Wisconsin Humanities. If the recent HE episode examining the 1912 Villisca, Iowa axe murder case was typical, viewers might want to keep one eyebrow raised (and have a "grain of salt" within easy reach) while watching any of the shows produced as part of this series. Yes, the episode was entertaining (if you are unfamiliar with the case). No, its conclusions did not correspond to known historical fact. For those who saw the program featuring an examination of the 1912 Villisca ax murder story, here are the discrepancies that we detected along with a few observations regarding historical, technical, and editorial matters. I want to commend the producers for presenting a fairly straight forward summary of the story at the beginning of the show. But after that, the show turns away from the history and squarely toward the sensational. As the cast arrives in the Villisca cemetery, the narrator proclaims that psychic profiler Carla Baron and psychic medium John J. Oliver were told only the names of the victims and the date of their demise. They do not say when the duo was given this information, and whether or not they were allowed to conduct their own advance research into the case. In addition, as they reveal their psychic observations, both historian Roy Marshall and Villisca Axe Murder House owner Darwin Linn give them additional story details that they incorporate into their final conclusions. I spoke with Villisca axe murder historian Roy Marshall earlier today, and he indicated that although he enjoyed working on the program, he was somewhat disappointed in the direction the show seemed to be taking during production. He anticipated a segment more focused on the evidence and history surrounding the case. He also said he didn't watch the show when it aired last week. 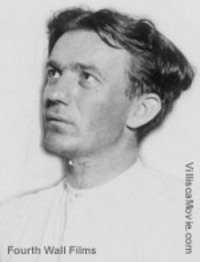 Contrary to the assertions of a comment received on this blog, the program did lay the murders squarely at the feet of William "Blackie" Mansfield (pictured) who, as noted in a previous blog, was nowhere near the crime scene at the time of the murders. The show suggested that Mansfield met with Senator Frank Jones, in Jones' home, to seal his contract to kill Josiah Moore. There is no evidence of any kind that Mansfield was EVER in Villisca. He had an alibi in Illinois verified by multiple witnesses, was never charged with the murders, and was never considered a serious suspect by local or state authorities. The commenter also suggested that if the psychics didn't receive advance information on the details of the case, that their observations must be coming from a witness to or victim of the crime. Applying a similar line of logic, if the psychics are in touch with someone with intimate knowledge of the case, the information they receive should (at the very least) not contradict the known historical record (see Hit & Myth and scroll down to "Suspects"). When we interviewed forensic expert and former FBI profiler Robert K. Ressler for our documentary "Villisca: Living with a Mystery" he categorically stated that the crime scene evidence indicated a sexual motive, and that it was definitely not a murder-for-hire, as asserted by the producers of HE. Victim Lena Stillinger, who the psychic said was haunting the Moore house, was sexually posed after death by the killer. There is no evidence, as the show claims, that she "did not die right away" or that she saw her killer. Or that Lena had a defense wound on her arm and was, "the only person that took a blow any place above the chin," according to axe murder house owner Mr. Linn (In Darwin's defense, this statement was edited and compressed and he likely didn't say it exactly the way it was presented in the show). Marshal Hank Horton testified in the 1917 Grand Jury that Lena had no wounds on her arm. All victims lay as they were sleeping when struck by the axe. Another forensic expert we worked with (a medical doctor) theorized that Lena's apparent movement in the bed was the result of an involuntary reflex in response to being struck in the head. Ressler (pictured on the left as we interviewed him), and other forensic experts we worked with, examined 400-500 pages of grand jury testimony by multiple witnesses detailing the crime scene. They were not provided with any additional details about the victims, the suspects, or any other facts prior to the presentation of their findings. Ressler, who coined the term "serial killer", also provided a profile of the likely killer that we included in our film. The program provided no new insight (as the narrator claims), and the victims and those accused falsely deserve better than this "Haunting Evidence" episode offered. Do we have a bias that favors historical, scientific, and psychological analysis of the Villisca crime over the findings of psychics and paranormal investigators? Unlike William Mansfield and F. F. Jones, we are...guilty as charged. Additional Notes: Crime scene photos featured in the show were speculative recreations and were not based on grand jury testimony. Only one photograph related to the crime scene is known to exist. It's a photo of the axe used in the killings and a lamp found in the Moore's upstairs bedroom that we used as our movie poster. At one point the narrator states that John Oliver and Roy Marshall are going to "...retrace the path the victims took from the church to their home that fateful night." Then suddenly they are shown walking near the Jones house. This suggests (visually) that the Jones house is "on-the-way" from the Presbyterian Church to the Moore house. It's not. 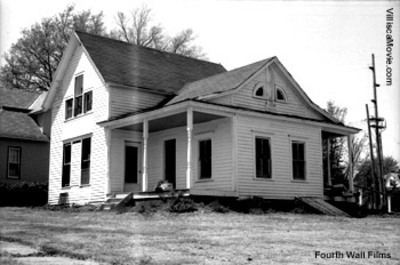 The F. F. Jones house is one block North and one block West of the Josiah B. Moore home. The assertion that Mansfield was at the Presbyterian church on the night of the murders, and left early to enter the Moore home and hide in a closet, is a garbled version of a fact related to a different suspect. George Lyn Jacklin Kelly, the only suspect tried in the axe murder case, was present at the Presbyterian Children's Day service and did observe the Moore, Stillinger, and other children as they performed. The notion that the killer was hiding in a closet in the Moore house is based on a rumor that circulated around Villisca in 1912. If memory serves, Minnie Moore, a relative of the victims, floated the unfounded and disproved theory to an over-eager newspaperman hungry for any new angle on the sensational story. In short, Grand Jury testimony confirmed that the downstairs and attic closets were too full of clothing, papers, and other personal items to accommodate an axe-wielding killer (or, indeed, even one without an axe). It strains credulity to imagine the killer emerging from the tiny upstairs closet covered in hangers and ladies dresses, swinging the axe, and casting hat and shirt boxes in all directions. Now that I think of it, the vision conjures up Anthony Perkins in a scene from Alfred Hitchcock's "Psycho." "One of the suspects, he worked in the slaughter house some and he preferred the job of killing the animals," said Linn. Darwin is referring to William Mansfield, but Mansfield was a member of the Sausage Workers Union, not the Meat Packers Union. The former indicates that he wasn't working on the killing floor at all. In fact, Mansfield was detained for questioning while working in the sausage-making room of Swift & Company in Kansas City, Kansas. 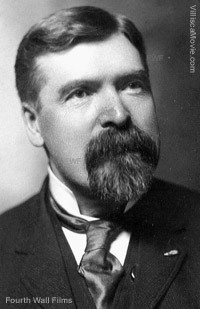 Later in life, Mansfield worked full-time as a union organizer and his Milwaukee, Wisconsin 1950s obituary praised his many contributions as a union man. As you might imagine, his relatives are horrified each and every time he is newly accused of being a mass murderer. The medium in HE describes Jones (pictured) meeting Mansfield in a "downstairs smoking room". Jones was a member in good standing of the Methodist Church, was the Sunday school superintendent, didn't smoke, and was proud to state that liquor had never touched his lips. Detective James Wilkerson falsely told people that Jones had been seen drinking a beer in a room above Bert McCaull's pool hall. Jones was nearly as appalled by that accusation as he was of being accused of hiring the murder of former employee Joe Moore. One possible explanation for the appearance of electromagnetic fields in a house without live wiring: the infamous structure is less than half a block from an electrical substation. "Haunting Evidence" kept referring to the Moore house as a "farm house." The house is located within the town of Villisca, and I suppose the description indicates that the producers' aren't aware that in 1912 people kept horses and other farm animals within city limits. There were three structures behind the Moore house in 1912: a coal shed, an outhouse, and a barn (the building recently erected on the property does not resemble the Moore's original barn). Finally, the Moore house (pictured as it appeared in 1994) became known as a "haunted house" for the first time when ghost hunters visited the scene in 1998. Every resident in the house since the 1930s told us, and/or the local newspaper, that the house was not haunted during their respective sojourns. The house has been restored with replacement furnishings to appear as it did in 1912 (though not all the furniture and artifact placement is consistent with grand jury eye witness testimony), and the house is a "must-see" for anyone interested in one of America's greatest unsolved mysteries and Iowa's worst mass homicide. There's only one film dedicated to telling the true story of the 1912 Villisca axe murders: "Villisca: Living with a Mystery." We invite you to purchase or rent a copy. You could make this stuff up, but why bother to embellish when the truth is so compelling? The producers of last night's episode of "Haunting Evidence" on the 1912 Villisca ax murders, once again trotted out the same old hack-kneed and baseless theory accusing William Mansfield (left) of murdering Joe Moore, and family, as hired by former Iowa State Senator Frank Jones. Kansas City Detective James Wilkerson hatched this "theory" with newspaperman Jack Boyle (as we discussed in a previous post) and tried unsuccessfully to frame Mansfield. A cursory, yet prudent, glance at actual historical records would quickly reveal that Mansfield had an alibi, and was cleared by a grand jury in 1916 of any involvement in the murders. "I wish some outside group would at least read the records contained in the Iowa State Archives in Des Moines," said historian Dr. Edgar Epperly. Epperly has researched the Villisca crime since 1955, and is considered the foremost authority on the still-unsolved mass murder. "They would find three statements by payroll employees of the John J. Grier company attesting to William Mansfield's employment in Montgomery Illinois when the murders occurred. They would also find investigative reports by Iowa state agents supporting these statements, and finally they would find signed payroll sheets placing Mansfield 400 miles away when the murder happened. Wilkerson's ghost is 'barking in Hell' this very minute for the injustice he did to William Mansfield." Entertainment, not the truth, seems to have been the priority. However, it's clear to me that people don't like to be sold a bill-of-goods in a show that purports to be based on true stories. For those interested in the true (and frankly, more fascinating) story behind the Villisca ax murders, stop back or subscribe to our blog for a forthcoming and more detailed response to the "Haunting Evidence" "Haunted in Villisca" episode. Also, check out Dr. Epperly's (factual) summary of the murders here. 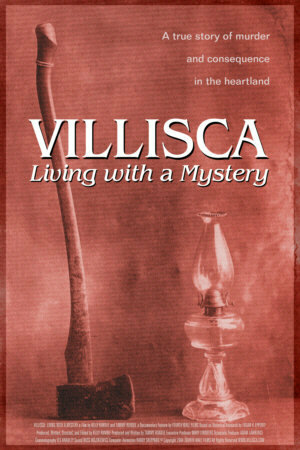 Several contacted us last night or this morning asking where they could buy "Villisca: Living with a Mystery" on DVD. Visit VilliscaMovie.com. It's also available, on Amazon.com, FamilyVideo.com and numerous other internet outlets. In addition, it can be special-ordered at any store that sells DVDs. It can be rented from Family Video stores and via Netflix. 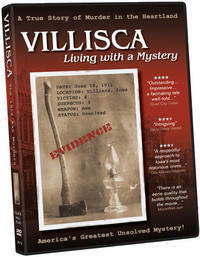 "Villisca: Living with a Mystery" is a factual account of one of America's greatest unsolved mysteries. The saying "truth is stranger than fiction" seems to have been created to describe this story. The website for CourtTV's "Haunting Evidence" has posted details regarding the upcoming episode featuring the 1912 Villisca axe murder mystery. They have also posted publicity stills like the one pictured above, apparently taken outside the Moore house. There are a few minor distortions in the episode's description and in the photo captions. This business about the sound of the killing being masked by a passing train is something we will easily debunk in a future post. It's a folktale that has developed relatively recently. I'm not sure why people who have actually visited the house, and noted its remote location in reference to the train tracks, believe that story. It's unlikely but more plausible in a couple of the similar murder cases. Be sure to take a look at the show tomorrow night, read our response (to the historical aspects), and post your own reactions. CourtTV will reportedly air a segment on the 1912 Villisca axe murders, one of America's greatest unsolved mysteries, in their series "Haunting Evidence" on August 29, 2007. Check local listings for air times. National television treatments of the 1912 Villisca axe murder story have been hit and miss, or as we like to say, Hit & Myth. However, we have had two good experiences with CourtTV in the form of a historical overview of the Villisca axe murders in their Crime Library and a live appearance by yours truly and Dr. Edgar Epperly on Catherine Cryer Live (see embedded video below). Seven years ago, the Fox Family Channel aired an unsolved mysteries series called "The Scariest Places on Earth" and one chapter profiled the Villisca ax murder story. The final product was rife with historical distortions including fake photos, a fake newspaper, and a fake interview. After we posted our analysis on line, people wrote back asking, "how could that be...why would a national network pass off fake material as historical?" It's entertainment...NOT news. What was news, was that the photos they passed off as the axe murder victims turned out to be those of an East Coast family of attorneys, one of whom was a former Vermont State Supreme Court judge. In addition, one of the "little" girls depicted, now an elderly woman, was surprised indeed to learn that she had been murdered in 1912. The final insult came when the show was released on home video and the description on the box said "Villisca, Ohio." It would be funny, if the axe murders weren't so tragic. A modicum of restraint and propriety should be excercised by media producers. Now I sound like Pollyanna. "Haunting Evidence" uses a "psychic profiler," a "medium," and a "paranormal investigator" to help shed new light on cold case unsolved mysteries. Psychics have appeared at the axe murder house in Villisca before with dubious results. Read our article regarding one psychic's physical description of Harry Whipple here on "Hit & Myth" (scroll down to "Suspects"). Like Pollyanna we play the "glad game" and hope for the best regarding "Haunting Evidence." In the meantime, learn the true story by visiting VilliscaMovie.com or by viewing "Villisca: Living with a Mystery." Enjoy the clip below. I was sicker than a dog when I did the live appearance in a Los Angeles studio, but with the help of over-the-counter cold meds, I muddled through. I was surprised when Catherine asked me about Reverend Kelly. The question was supposed to have been given to Ed at his Minneapolis location, but a momentary loss of his broadcast signal forced the changeup.